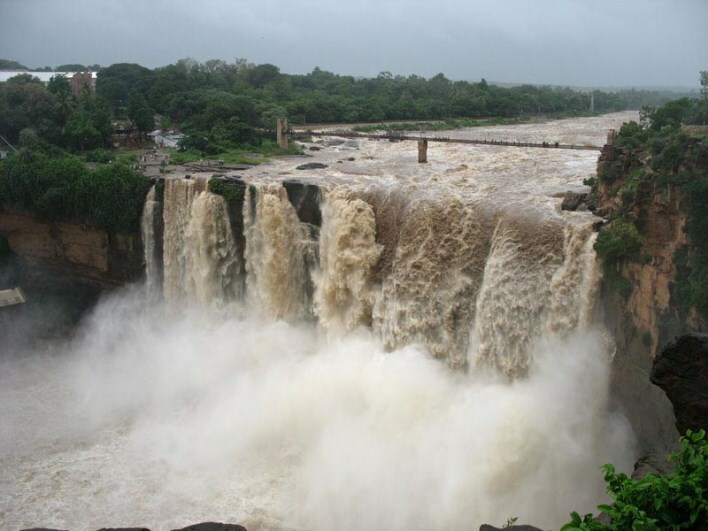 Gokak falls is a waterfall known for its beauty. It is at a distance of 60 Kms from Belgaum and 10 kms from Gokak town. Located right on the main road is a celebrated tourist center in the district. This falls has a height of about 170 feet. The river Ghataprabha after winding a course of a long route takes a leap of 52 meters, over a rocky bed 170 feet down. The falls is famous for its spread and shape.Except in width and colour of the water, the general features of the fall, its height, shape and rapidity above are much like those of ” Niagara”. The waterfall is horse shoe shaped at the crest, with a flood breadth of 177 metres (580 ft). During rainy season the thick reddish brown water sweeps far over the brink of the cliff with a dull roar that can be heard from some distance. Gokak gets its name due to the Goki trees found in abundance in these areas. Electricity was generated here for the first time in the country in 1887. The generating station can be reached on the ropeway. Recommended only for the extra courageous! A walk down either bank of the rocky gorge rewards you with ancient Chalukyan monuments waiting to be explored. July to September is the best season to visit the place. 10 kms from Gokak falls there is a village named Godachinamalki a trek of 2 Kms from here takes you to a beautiful falls the stream flows in a slow rhythm until the first drop of about 70 feet as one treks to the spot, one comes across a long line of tiny falls that add up to make the big jump. The area being a rocky bed facilitates the creation of numerous lovely cascades to give the look of a royal bath in a palace complex. The main falls dips again a little further by another 50 feet before joining the Ghataprabha. This is truly rejuvenating falls, unspoilt and devoid of noisy crowds.